Why train for just one career, when you could be training for several? The Best Training For The Best Careers In Only 15 Weeks! Where Will Your Career Training Take You? Our 600 Hr. career training program has generated proven results! Our Graduates have landed careers in their field of study and have since been gainfully employed! Obtain education, skills and the certifications you need to succeed. The right career training can land you the right job! Higher paying wages for careers with a higher demand. It's true, 96% of our students enjoy a career in their field of study! Careers with; 401K, Great Benefits, Insurance and Retirement! This is the Stability and Security we all strive for! Start living your dream! Click to download or print our Flyer! Download or Print our new flyer! "After I got out the Military I decided to pursue a career in the field of "Energy Transmission" as a "Lineman". I understood the importance of have additional Licenses, Certifications and Training so I enrolled here at the American Truck School. The Instructors here are patient, knowledgeable, and always motivating. I highly recommend this school to any one looking for a career as a Utility Worker, also to other Veterans looking for a career change. My experience here was great one and to make it even better...my G.I. Bill covered everything!" Saturday - Sunday: Available by appointment. Contact one of our career specialists today! 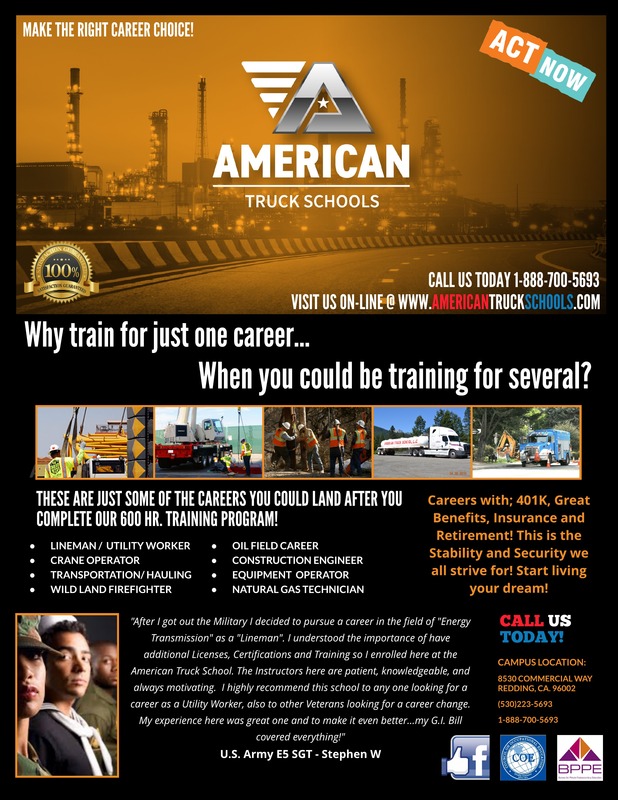 Copyright © 2018 American Truck Schools - All Rights Reserved.